Wall Street stages a sharp retreat after labor market and manufacturing reports raise worries about the strength of the recovery. Bank stocks plunge. NEW YORK�(CNNMoney.com) -- Stocks tumbled Thursday after a bigger-than-expected rise in weekly jobless claims and a weaker-than-expected reading on manufacturing sparked worries about the pace of the economic recovery. The Dow Jones industrial average (INDU) fell 203 points, or 2.1%. The S&P 500 (SPX) index lost 27 points, or 2.6%. The Nasdaq composite (COMP) shed 65 points, or 3%. "Some of the selling is because it's a new quarter and people want to take a little off the table," said Dave Hinnenkamp, CEO at KDV Wealth Management. "But there's also growing concern about whether there can be any earnings growth with consumer spending still tapped out," he said. "And people are worried that when the stimulus wears out, the economy won't have enough momentum to keep charging ahead on its own." Friday brings the week's biggest economic report: The monthly jobs report from the government. Employers are expected to have cut 175,000 jobs from their payrolls in September after cutting 216,000 in August. The unemployment rate, generated by a separate survey, is expected to have risen to 9.8% from 9.7% in August. Thursday's market: Many of the stocks and sectors that fueled massive third-quarter gains also drove the selloff on Thursday, the first day of the fourth quarter. Dow components JPMorgan Chase (JPM, Fortune 500) and American Express (AXP, Fortune 500) were among the financial shares sliding on the day, dragging down the KBW Bank (BKX) index by 5%. Yet financials were the biggest gainers in the third quarter, with the sector as a whole spiking 25% and the KBW index rising 29.5%. Industrials and materials gained more than 20% each in the July-through-September period, and both those sectors tumbled too. But declines were broad-based, with all 30 Dow stocks falling, including Boeing (BA, Fortune 500), Chevron (CVX, Fortune 500), Exxon Mobil (XOM, Fortune 500), IBM (IBM, Fortune 500), Microsoft (MSFT, Fortune 500), Hewlett-Packard (HPQ, Fortune 500) and Caterpillar (CAT, Fortune 500). Stocks are coming off the best quarter in more than a decade, leaving markets vulnerable to a little selling, particularly amid the recent spate of weaker-than-expected economic reports. "We're getting a sense that while things have bottomed, we are not getting a significant snap back," said Haag Sherman, managing director at Salient Partners. "We're going through a process where corporate profits will be robust, but the economic recovery will be spotty." Worse-than-expected reports on the labor market, consumer confidence and Midwest manufacturing have caused stocks to slide in five of the last six sessions. But the modest selloff barely dented an otherwise robust third quarter. The Dow and S&P 500 both gained 15% in the July-through-September period, seeing the biggest quarterly gains since the fourth quarter of 1998. 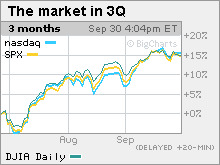 The Nasdaq rose 15.7% and saw its best quarterly gains since the second quarter of 2003. But stocks have been vulnerable recently after the massive rally that has essentially propelled the major indexes for seven months straight, with only a brief retreat in late June and early July. Since bottoming at a 12-year low March 9, the S&P 500 has gained 56%, and the Dow has gained around 48% as of Thursday's close. After hitting a six-year low, the Nasdaq has gained nearly 64%. 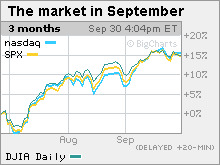 But calls for a big September selloff never materialized, with any selling pretty minimal. Analysts say that there are still enough supportive factors in play to keep stocks flat to higher through year end. Supports include improving corporate profits, a slowly stabilizing economy and a still-considerable amount of fiscal and monetary stimulus. Economy: The Institute for Supply Management's September ISM index fell to 52.6 from 52.9 in August. Economists surveyed by Briefing.com thought it would rise to 54. Also on the downside, weekly jobless claims jumped more than expected last week. The number of Americans filing new claims for unemployment increased to 551,000 from 534,000 the previous week. Economists thought it would rise to 535,000. On the upside, the index of pending home sales surged 6.4% in August versus forecasts for a rise of 1%. The index, from the National Association of Realtors, increased 3.2% in the previous month. Personal income and spending both gained more than had been anticipated in August, according to a Commerce Department report released Thursday. Personal income increased 0.2% after rising 0.2% in the previous month. Economists thought it would edge up 0.1%. Spending jumped 1.3% after rising 0.3% in the previous month. Economists thought it would gain 1.1%. Another government report showed construction spending edged up 0.8% in August after falling 1.1% in July. Economists thought it would fall 0.1%. Bernanke: Federal Reserve chairman Ben Bernanke is testifying at a House Financial Services hearing on the central bank's perspective on proposed reforms to the financial regulatory system. Bernanke backed most of Obama's plan for overhauling the regulatory system, with the exception of a consumer agency. Companies: Comcast (CMCSA, Fortune 500) has disputed reports that it is in talks to buy part of General Electric (GE, Fortune 500)'s NBC Universal. Comcast shares slumped 7%, while GE shares fell 2%. Cisco (CSCO, Fortune 500) said it is buying Norway's Tandberg ASA, a video conferencing hardware maker, for $3 billion in cash. Cisco shares dropped 1.5%. Late Wednesday, Bank of America (BAC, Fortune 500) said that CEO and president Ken Lewis is retiring Dec. 31 after 40 years with the company. He is expected to receive $53 million in pension benefits. BofA did not name a successor. Some analysts say Lewis's departure only heightens concerns surrounding the firm. BofA shares lost 4.2%. Also late Wednesday, General Motors said it is shutting down its Saturn division after a deal to sell it to Penske Automotive Group (PAG, Fortune 500) fell apart. Market breadth was negative. On the New York Stock Exchange, losers beat winners by more than five to one on volume of 1.60 billion shares. On the Nasdaq, decliners beat advancers four to one on volume of 2.75 billion shares. Autos: Automakers were reporting September sales throughout the day. Sales were hit by the end of the government's Cash for Clunkers program and diminished inventories. The best performer in the month was Ford Motor (F, Fortune 500), which said sales fell 5% from a year earlier. The company was expected to report a 10% year-over-year sales drop. Rival GM said sales fell 45% from a year ago, versus forecasts for a drop of 46%. Toyota, the biggest beneficiary of the Clunkers program, posted a worse-than-expected loss of 13% versus a year ago. World markets: Global markets tumbled. In Europe, London's FTSE 100, France's CAC 40 and Germany's DAX all slipped in afternoon trading. Asian markets ended lower. Currency and commodities: The dollar gained versus the euro and fell against the yen. U.S. light crude oil for October delivery rose 21 cents to settle at $70.82 a barrel on the New York Mercantile Exchange. COMEX gold for December delivery fell $8.60 to settle at $1,000.70 an ounce. Gold closed at a record high of $1,020.20 two weeks ago. Bonds: Treasury prices rallied, lowering the yield on the benchmark 10-year note to 3.20% from 3.30% late Wednesday. Treasury prices and yields move in opposite directions.